Get to know Crémant d’Alsace and the range of Crémants: high-quality sparkling wines produced throughout France. Happy Birthday, Crémant d’Alsace! This lively sparkler from northeastern France turns 40 today, so what better way to celebrate than to pop some corks? On August 24, 1976, this bottle-fermented fizz became an officially recognized sparkling wine under French law. The tradition of making such wines in Alsace is much older. When Alsace winemaker Julien Dopff visited the Universal Exhibition of Paris with his father in 1900, a demonstration of Champagne winemaking gave them the idea to do the same with grape varieties traditional to Alsace. Dopff spent two years in Champagne before he returned to Alsace. Crémant d’Alsace is still made in this traditional method, and it’s the second-most popular sparkling wine in France, trailing Champagne. Small wonder, since Crémant d’Alsace is made with similarly strict rules. “Crémant” is the French term for traditional-method sparkling wines made outside Champagne. This means that the second fermentation, which gives the wine its bubbles, must happen inside the bottle. That’s followed by a minimum aging period of nine months on spent yeast cells, or lees. This maturation gives the wines their creamy texture. Champagne is mostly made from Pinot Noir, Pinot Meunier and Chardonnay under strict guidelines. Most Crémant d’Alsace is made from sprightly, crisp Pinot Blanc, even though Auxerrois, Pinot Gris, Riesling, Chardonnay and Pinot Noir grapes are allowed. In the case of Crémant d’Alsace Rosé, the law requires it to be 100% Pinot Noir. Some Alsace Crémants are single-varietal wines, while others are blends. But all exhibit dryness and freshness. Indeed, the grapes must be treated gently: hand harvested, transported in boxes that prevent crushing and, once in the winery, whole-bunch pressed. Only lightly pressed juice, namely the first 100 liters of each 150 kilograms of grapes, can be used. Considering all this, Crémant d’Alsace presents fantastic value. Traditional Homes in Colmar, Alsace, via Getty. Many winemakers go beyond these rules. They make Crémants from single vintages, single sites and with much longer aging, which lends more creaminess and richer flavors to nonetheless slender wines. Jean-Christophe Bott of Domaine Bott-Geyl wants to bring the same “lightness, finesse and drinkability” to his Crémants as he does to his still wines. He ages his Crémant at least 24 months. While Alsace is almost as far north as Champagne, it’s much drier, warmer and sunnier. This produces slightly riper grapes and more rounded, generous flavors. It also means that many Crémants have low or no dosage, which is the addition of sugar before bottling that balances the tart acidity of most sparkling wines. Such sparklers are labelled extra brut, brut nature or brut zéro. Marie Zusslin of Domaine Valentin Zusslin makes a single-site Crémant from a walled, southeast-facing vineyard called Clos Liebenberg. “When grapes are slightly riper, the acidity is fine and ripe, and a low dosage brings more balance and harmony to the Crémant,” says Zusslin. Thomas Boeckel makes one of his Crémants from some of the oldest Chardonnay vines in Alsace, and dosed his 2012 vintage with just 2 g/L (grams per liter) of sugar. How many Crémants are there? Besides Crémant d’Alsace, there also are Crémants de Loire, de Bourgogne, du Jura, de Savoie, de Limoux and even Crémant de Bordeaux, covering all of France. Production rules insist on hand harvesting, gentle pressing, bottle fermentation and a minimum of nine months aging on lees, but differ according to the predominant grape varieties of the respective regions. Two of the more notable Crémants after Alsace hail from the Loire and Burgundy. Chenin Blanc, with its quince flavor, features heavily in the very fine-boned and racy Crémants de Loire, but Chardonnay and Cabernet Franc are also used. Most of the production is concentrated in the beautiful town of Saumur, where a number of time-honored producers like Bouvet-Ladubay and Langlois-Chateau, both owned by Champagne houses, age their Crémants in vast underground cellars hewn into the soft tuffeau stone. Crémant de Bourgogne is a value alternative to Champagne, as it’s also based on Chardonnay and Pinot Noir with similar flavor profiles, if less complexity. While unusual indigenous varieties like Poulsard and Savagnin can be used to make Crémant de Jura, most is based on the crisp Chardonnay grown in the sub-alpine vineyards of this mountainous region of eastern France. The two indigenous varieties of Jacquère and Altesse, along with Chardonnay, constitute Crémant de Savoie. This sub-alpine region also has a long history of making fizz, but has only been allowed to label its sparkling wines Crémant since 2014. At a suitably cooler altitude, the South of France is represented by Crémant de Limoux from the Languedoc. Limoux is famous for its historic sparkling wine “Blanquette de Limoux,”—storied to predate Champagne—based on the local Mauzac grape. Crémant de Limoux must be made from at least 50 percent of either Chardonnay or Chenin Blanc. Here, Blanquette stands for local tradition, while Crémant stands for a modern, international style. 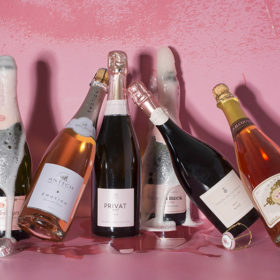 If this effervescent list leaves you wondering where to start, just remember that sparkling wine is central to the French way of life. Nobody needs any excuse to pop a cork or two. Riquewihr village vineyards in Alsace, via Getty. Boeckel 2011 Extra Brut Chardonnay (Crémant d’Alsace); $22, 93 points. Chalky, stony notes come to the forefront on this austere, restrained, non-dosed vintage crémant. The taut texture carries green apple and citrus tones, with a satisfying, savory soy sauce backdrop. This is poised and precise, fresh and refreshing, clean and structured—a testament to the nobility of Chardonnay. Domaine Bott-Geyl NY Paul-Edouard (Crémant d’Alsace); $24, 93 points. Mature winter apple, oatmeal and the intricate aromas of dark pine honey give a complex, rich nose to this crémant. The honeyed notes become more pronounced with air and create a thrilling counterpoint to the streak of lemony freshness that pervades the palate. The mousse is integrated, fine and soft while the autolysis lends layers of brioche, oatmeal, earth and yeast. It has backbone, character and a beautifully long finish. Zusslin 2012 Clos Liebenberg (Crémant d’Alsace); $58, 93 points. Lovely notes of Golden Pearmain apple perfume the nose, with hints of soy sauce. The body and palate are luminous showing green apple freshness that come across as light, graceful and authentic. There is something honest and fresh-faced about this wine that is rather disarming. This is a very beautiful, classy crémant made from a blend of Riesling and Auxerrois. Domaine Barmès-Buecher 2012 Brut Zero Dosage (Crémant d’Alsace); $NA, 90 points. Freshly sliced green and yellow apples are the aromatic markers of this dry, softly fizzing crémant. There is substance and body from yeasty autolysis that comes across as the golden crust of wheat bread, with the apples always peeping through. An elegant apéritif without dosage and all the purity of ripe, delicious fruit. Lucien Albrecht NV Brut Rosé (Crémant d’Alsace); $17, 90 points. Tart red currant, rhubarb and strawberry come together in a very refreshing, rounded and appetizing fashion. The frothy, foaming mousse is exuberant and highlights these strawberry shortcake flavors brilliantly, while a totally dry palate makes sure that this stays classy. This is very satisfying, fun and fruit-driven, with a serious core and a bright, lemony finish.